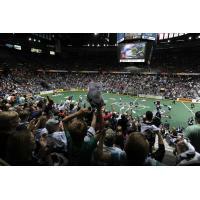 The best season in the history of the Edmonton Rush is over. It's a good bet, though, that the party rages on somewhere. The Champion's Cup is in the Rush's possession and there's no doubt that the players are coveting every single second they have with the NLL's grand bauble. A terrific season ended this past Saturday when the Rush claimed their first league title in franchise history, sweeping the Toronto Rock 2-0 in the best-of-three final series and winning the deciding game on their home turf of Crystal Glass Field before a raucous crowd of more than 12,000 fans. It was a brilliant conclusion to the year, the only ending that would have satisfied the players - several of whom were part of the 2012 crew that lost the Champion's Cup one-game final to Rochester, and the entire cast that were favored to beat Calgary in last season's West Final only to lose the series in Game 3. *Ben McIntosh, the number one pick in the draft, surely locking up Rookie of the Year honors with an 86-point campaign including 37 goals - three of which were game-winners. *Robert Church cracking the top-10 in league scoring, going from 52 points in his rookie season to 92 points this season. *Zack Greer toppling the 40-goal mark for the first time in his career along with a career-best 80 points. *Kyle Rubisch certainly being in the hunt for a fourth straight Defensive Player of the Year award after 36 caused turnovers and 118 loose balls . and he was even better in the playoffs. *Ryan Dilks joining Kyle Rubisch, Chris Corbeil and Brett Mydske in the conversation of the NLL's best defenders. *Jeremy Thompson becoming one of the NLL's most versatile players as a top-draw faceoff man, loose-ball collector, turnover creator, and feisty competitor. *Aaron Bold putting off-turf distractions behind him during games to rack up league-leading totals between the pipes. Rush GM/head coach Derek Keenan managed this team from the bench and the front office to near-perfection. He made a crafty trade-deadline acquisition in Matthew Dinsdale plus smartly executed moves that brought the first overall pick (Ben McIntosh), backup goalie and bench booster Tyler Carlson, and additional draft picks. The moves that Keenan made this year and in previous seasons set the Rush up well for the future. One Champion's Cup victory could very well lead to raising the trophy again and again. Playoff Stats: Mark Matthews, the Champion's Cup MVP, was tops in the playoffs with 13 goals and 27 points, and finished second with 14 assists. Matthews, who had a playoff-leading six power-play goals and five power-play assists, also was the leader in Three Star Voting with 20 points (4 x First Star) with Rush goalie Aaron Bold finishing third with nine points (3 x Second Star) . Bold was tops amongst NLL playoff goalie with four wins and a 9.39 goals-against average, and he was second in both total saves (143) and save-percentage (.787) . Robert Church and Zack Greer were tied for third with eight goals. Church was eighth in points with 15, and Greer was tied for ninth in points (14) . Ben McIntosh and Matthew Dinsdale, the hero of Game 2 with the game-winner, were tied for 11th with 13 points. Dinsdale was tied for fourth in assists (11) and McIntosh was tied for ninth in helpers (8) . Rush transition standout Jeremy Thompson was tops with 41 faceoff wins, and second in both loose balls (29) and caused turnovers (7) . Kyle Rubisch led the league with eight forced turnovers, with Brett Mydske tied for third (6), and Ryan Dilks was tied for eighth (5) . Chris Corbeil (sixth - 24), John Lintz (ninth - 20), and Kyle Rubisch (10th - 19) were all top-10 in loose balls . Edmonton ended up third on the power play at 52.2% and tied for third on the penalty kill at 50.0%. And The Nominees Are: The season may be over on the turf, but it's about to begin when it comes to the NLL's annual list of awards. Nominees will be announced starting June 15th and carry through for about the next 10 business days with one per day. The awards will be handed out on Sept. 29th, and the ceremony usually coincides with the NLL Entry Draft. Sportsmanship (June 15) - The Rush could probably have several players up for the award as the group as a whole is very discipline and is at the bottom of the league in penalty minutes. There's also a plethora of hard workers on the team as well. Narrowing it down, it will probably be Robert Church and Jarrett Davis in the hunt. Church had a breakout season finishing 10th in league scoring with 92 points, while Davis was a key contributor at both ends of the floor and played with fire throughout the year. Defensive Player (June 16) - Will it be four in a row for Kyle Rubisch? More than likely, but he'll certainly get the most competition from teammate and Rush captain Chris Corbeil, who was runner-up to Rubsich a year ago. And don't forget Brett Mydske. Heck, the whole Rush 'D' could be considered and probably would be nominees on pretty much every other team in the league. The Rush have plenty of riches coming out the back door including John Lintz, Jeff Cornwall, and the highly unheralded Ryan Dilks. Transition Player (June 17) - It's another position of strength for the Rush as they have a very mobile defense. Of the true transition players, Jarrett Davis defines the role as he is a valuable offensive producer (46 points) and a solid defender, too (61 loose balls and 19 caused turnovers). Another Rush nominee could also be multi-purpose contributor Jeremy Thompson, who was third in the league in both loose balls (181) and faceoff wins (246). And few in the league play with Thompson's passion. Goaltender (June 18) - Does Aaron Bold finally get his due and supercede Rochester's Matt Vinc as the league's top stopper? Bold led NLL goalies in regular-season wins (12), goals-against average (9.44) and minutes played (1,016), plus he was fourth in total saves and fifth in save-percentage. Those numbers and the nominations all came before the playoffs where Bold was stellar again especially in the Champion's Cup Final. Bold was also a source of inspiration for the Rush, too, as he stood tall and performed at the top of his game despite the fact his beloved life partner Michelle was battling breast cancer. Coach (June 19) - Derek Keenan is up for his fourth Les Bartley Award as the league's top bench boss. He won it last year yet this season it was more evident that the Rush are what they are - league champs - because of Keenan's presence. Keenan missed the first two games of the season after the passing his wife Wendy. When he returned, the team corrected an 0-2 start, overcame some hurdles during the year, and captured the West with 13 wins. To a man, the Rush players heap praise on Keenan, and it's quite likely he takes the honor again. General Manager (June 23) - Derek Keenan is the only three-time winner of the NLL's GM and Head Coach of the Year awards, and without a doubt, he'll get serious consideration for a fourth honor. Every GM in the league would have picked Ben McIntosh first overall in the draft, but Keenan made several right moves through the year, and more importantly, didn't panic and make any moves during the team's difficult moments. Very smartly, Keenan did pick up Matthew Dinsdale at the trade deadline, and though he was a lesser name than other who moved, Dinsdale was the best acquisition of the bunch. Rookie (June 24) - No doubt the engraving is already done with the Rush's Ben McIntosh already etched onto the trophy. There wasn't another rookie close to McIntosh, the No. 1 overall pick in the 2014 draft, in terms of results this season. McIntosh finished third on the team and 14th in the league in scoring with 86 points, tying him with Toronto standout Stephan Leblanc and putting him ahead of league notables Dan Dawson and Brett Hickey. McIntosh will be the second Rush to win the award following up on Mark Matthews in 2013. Most Valuable Player (June 25) - The Rush could arguably put forth several names - Mark Matthews, Zack Greer, Ben McIntosh, Robert Church and even Aaron Bold. When the final nominations come out, it's bound to have Matthews' name on it. Matthews broke all the Rush scoring records and finished second in league scoring with 115 points. He was also one of only fourth players to score 50+ goals with 53, and earned himself a coveted spot on the NLL's single-season 50/100 squad - one of only nine players to hit that target. Matthews became the superstar the Rush have always needed and he is now widely regarded as one of the best players in the NLL today. Teammate (June 29) - Several Rush names could make the final nomination list. Certainly Mark Matthews will be considered. So too should be Aaron Bold, Robert Church, Jarrett Davis, and Chris Corbeil. Hard to pin this one down since it's a new award, but going to guess that if a Rush makes the final cut it's going to be Davis since he's been handed accolades throughout the season by his coach and teammates for unselfishly giving up some time on offense to play more of a defensive role. Pinty's Wingman (June 30) - Passing prowess and playmaking sum up this sponsored award. Mark Matthews captured the weekly honor twice during the regular season. Other mulit-time weekly winners were Toronto's Josh Sanderson, Dhane Smith of Buffalo, and Calgary's Shawn Evans. Matthews finished fourth during the regular with 62 assists and was tied for third with 23 power-play assists. Executive (July 2) - Rush owner Bruce Urban was up for the award last year, and might crack the nomination list again this season. Bruce helped create the Rush's special 10th anniversary jersey, and was instrumental in the Rush's development of Superhero jerseys that were auctioned off to fans with the money raised going to support Rush goalie Aaron Bold and his life partner Michelle during her battle with cancer.